Fireflies and Jellybeans: ConsumerCrafts.com... Cyber Monday deal alert! 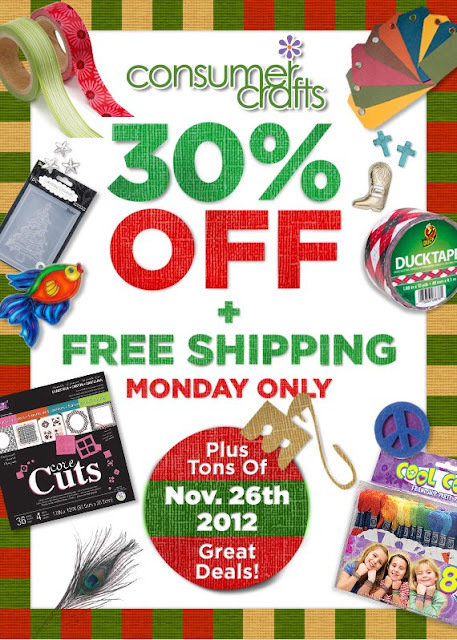 I have an awesome deal alert for you for some of the best online craft supplies around! ConsumerCrafts.com is having an amazing sale On Cyber Monday! On Nov 26th they are having 30% off and FREE shipping! Make sure you mark your calendars for these great deals! Just looking around ConsumerCrafts.com I found lots of stuff that I need/want/gotta have! I could spend days on this site! You can get Silhouette supplies! Oh- how I love heat transfer! Baker's twine... love love love... on cards, on home decor, on anything! I also love me some punches and these Martha Stewart Crafts™ All Over the Page punches are so cool! I love to crate my own backgrounds with them! They are also going to have some great deals on Friday with Door busters (while Supplies last!) going all weekend with the last day of door busters on Monday! Wow!!! So many things, and such great prices too. I am definitely ordering a fabric cutting tool for my Silhouette Cameo. Thanks for sharing about this wonderful site!